Rinse the chicken breasts and place in a large ziplock bag. Pour in enough of the Mango Vinaigrette to fully cover the chicken. Place in the fridge for at least 4 hours. Preheat oven to 350 degrees F and grease a pan with coconut oil. Bake the marinated chicken breasts for 30 minutes until cooked through, then turn on the broiler for 3-5 minutes until deeply golden. Chop and set aside. In a large bowl combine all of the remaining ingredients along with the chopped chicken. 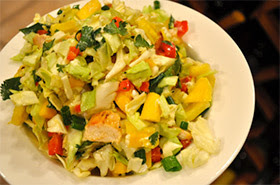 Drizzle a little of the mango vinaigrette and mix well. Heat the oil in a large, deep skillet over medium-high heat. Season the chicken on both sides with a sprinkle of salt and pepper. Once the oil is rippling, add the chicken and let it sear (about 4 to 5 minutes) before flipping it. Once browned on the first side, flip each piece of chicken over and cook until browned on the second side and fully cooked throughout (about 3 to 4 minutes more). Transfer the chicken to a bowl and set aside. Add the summer squash, onion, ¼ teaspoon sea salt, and ⅛ teaspoon black pepper, and cook (stirring occasionally), until the vegetables are tender and just starting to brown in spots, about 6 to 8 minutes. Add the garlic and cook 1 minute more, stirring constantly. Add the chicken and cook until re-warmed, about 1 minute. September marks month 2 and the final 4 weeks for our Color Run team training. We will test our progress on Saturday, October 3rd at 9:00am! To join the Synergy Fitness for Her Color Run team, click the link below to register, and begin interval training with the team to prepare for your run/walk. Intervals are posted on the cardio announcement board. Due to popular demand, an additional yoga class with instructor Eleanor Cole Levinson has been added! We now offer yoga every Wednesday at 7:30pm and Sunday at 1:00pm. All levels welcome.